Frank McClelland offers creative New American-French cuisine in stylish environs. Open for Lunch daily 11:30 a.m.-2:30 p.m., Dinner nightly 5:30 p.m.-10:30 p.m., Tea Sat.-Sun. 1:30 p.m. & 2 p.m.
About the restaurant and décor: L'Espalier is the kind of experience most patrons reserve for big-number birthdays, anniversaries or business deals. Stylishly spare dining areas in austere gray and taupe tones dominate the space, while the book-lined back room provides a library-like oasis. Dinner may also be enjoyed at the Chef's Table inside the kitchen. About the food: Chef/proprietor Frank McClelland's French-inspired New American cuisine is exquisitely built from impeccable local ingredients. 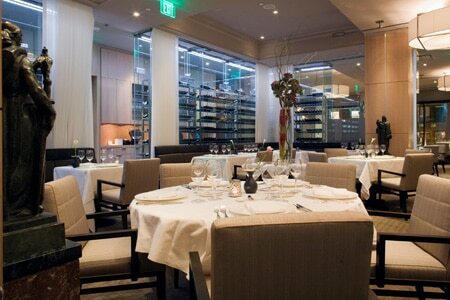 At lunch, you’ll find à la carte options, a five-course tasting menu ($68) and chef’s tasting journey ($108). Dinner presents a five-course tasting menu ($98), eight-course tasting menu ($118) and chef’s tasting journey ($208). (Wine pairings are available for an additional charge.) Prices may be steep, though few would challenge their value given the parade of topnotch meat, fish, shellfish and produce embellished with luxury flourishes like foie gras or black truffles, all beautifully plated. (Vegetarian gourmands can also dine exceptionally well here by requesting the tasting of seasonal vegetables.) First courses like butter-poached Maine lobster with confit halzenuts, roasted strawberries, pico de gallo, toasted nori and coriander might precede duck terrine with buttermilk "risotto" and liver vinaigrette, followed by Pineland Farms roasted beef sirloin with lime sesame vinaigrette, ginger potato pave, snap peas and king trumpets. Anything from the cheese cart, meanwhile, is sure to delight. Desserts provide interesting end notes such as white chocolate crémeux with hibiscus poached apples, toasted sesame, passion fruit, rhubarb and black raspberry sorbet or earl grey soufflé with lemongrass anglaise and lemon-thyme ice cream. About the wine: While the superb wine list counts classics from Burgundy, Bordeaux and other French wine regions among its collection, there is also a contingent of bottles from California, Oregon and Washington. The subtle, highly polished service doesn't miss a beat.